Extend your personality to every corner of your home with an impressive list of Breeze Collection inclusions to tailor the look. Choose from a range of Colorbond® steel roof colours, or roof tiles. Colorbond® fascia and gutters are also included. Colorbond® steel sectional overhead door with super quiet closure in your choice of colour. Façade shown is not standard and will incur an additional charge. Driveway, decking, fencing and landscaping not included. Choose from a range of COLORBOND® Steel roof colours or concrete roof tiles to complement your façade palette. COLORBOND® Steel fascia and gutters also included. Convenient sectional overhead door with super quiet closure, in your choice of door colour. Family members can come and go as they please with the flexibility of three remote control transmitters. Architecturally styled aluminium windows for a polished look and easy maintenance, in your choice of colour. Stand out on the street with a designer façade, with our no charge face brick façade options in varying brick colours. Create a sophisticated entrance and be welcomed in through a painted timber front door with clear glazing, accompanied by a single cylinder deadbolt on a rectangular chrome backplate for security and peace of mind. Cleaning the dog, hosing off the car or tending to the garden are much easier with access to two external garden taps. 2040mm high flush panel doors with keyed lock for internal access to the home. Be inspired by your choice of Caesarstone® colours to your 20mm island and rear kitchen benchtops as standard. Create more stylish storage space with the laminated cabinetry, including portrait doors to overhead and under bench cupboards. Keep things out of sight and free up space in your kitchen with your walk-in Butler's Pantry with melamine shelves and flush panel door. Finish the look with your preferred selection of designer handles, complementing doors and drawers with functionality and style. Microwave provision including single powerpoint. Inset and stainless steel, the sink offers a generous 1 and 3/4 bowl, which is both convenient and easy to clean. Ceramic tiled splashback available in your choice of colour and design for sleek, and easy to clean, styling. Stylish and more sustainable, AAA rated chrome basin mixer. Dishwasher provision including single powerpoint. High quality vanity unit with fully lined interior and laminated exterior provides plenty of storage space for all of your personal items. Complete the look with your choice of handles. Create your ensuite zone starting with your choice of colour to laminated 20mm benchtop with shadow line. Wash your hands and brush your teeth in style with above counter basin to your vanity. Enhance the sense of space and share natural light with a well-proportioned frameless vanity mirror. Discreet and designer, the toilet suite offers a soft closing lid and chrome toilet roll holder. Chrome double towel rail or robe hooks complete your ensuite functionality (design specific – as shown on master plan). Shower yourself in style with a hand-held shower rose with adjustable slide rail and save water with AAA rated chrome wall mixer. Style is seamless when you step into the shower, delivered by semi frameless shower screen with clear safety glass. The fully tiled shower recess and base accentuates sleek ensuite design. Be bold, or be subtle, or somewhere in between with your choice of colours and designs. Create your bathroom setting starting with your choice of colour to laminated 20mm benchtop with shadow line. The must-have feature is an on-trend designer bath to all homes. Chrome single towel rail completes your bathroom functionality. Extend your indoors and embrace the Queensland climate to eat outside or entertain, with your undercover alfresco with plaster ceiling. Sleek aluminium sliding doors keep your family safe with standard keyed deadlock (house specific - where shown on masterplan). Designer styled aluminium windows deliver a polished look inside and out. Secure your family with safe window locks to all openable windows. Create a sense of space with 2440mm nominal ceiling height to all single storey and double storey homes. Modern 75mm cornices are provided standard throughout for a polished finish. Every home has 67mm skirtings, and 42mm architraves around windows and doors throughout. A professional Dulux 3-Coat Paint System to internal walls adds a sophisticated touch, while a 2-Coat System to ceiling and cornices provides a subtle finish. Bold impact high gloss enamel paint to interior skirtings, architraves and interior doors offers style whilst also protecting everyday surfaces. Enjoy peace of mind that your home is not only stylish but also energy conscious with all homes complying with the Building Code of Australia. Stay warm in winter and cool in summer with R3.5 batts to roof space plus R1.5 batts to external walls. A 170 litre electric heat pump hot water system will ensure you’ve always got hot water on hand to shower, wash up or soak. 100 per cent building code compliant with exhaust fans above showers where required. Safety always comes first with smoke detectors as per master plan, wired direct so they never go flat. All the details covered right down to the light fittings with fluorescent globes and shades to batten holders so your new home is lit from the moment you walk in. Have power at arm’s reach with convenient double powerpoints right throughout your home. Never miss your favourite show again with single TV point for single storey homes and two to double storey homes. Uncomplicated style steps you through each doorway, with 2040mm high internal flush panel doors. Protect your walls with cushioned door stops where required. Stylish chrome lever design handles to all internal doors means your home will stay stylish for years to come. Within building allotments of up to 640 square metres with a 4.5 metre setback, all site and connections are taken care of for you with underground power, sewer, storm water and water connections to specified points. A maximum of 500mm fall is acceptable over building area made up of 250mm equal cut/fill. Includes class “S” concrete slab (monolithic) on level site with complete termite control protection to AS.3660.1 plus stainless steel mesh flanges to concrete slab penetrations and full stainless steel mesh to perimeter of brickwork including garage. Excludes rock removal, telephone service and consumer account opening fees. Showcase your staircase with timber painted handrail as well as carpet grade treads and risers. Store more, and see it easily with generous linen closets. Find more to fill the space or enjoy the abundance or room for clothes with melamine shelf and chrome hanging rails to robes. The Breeze Collection features freedom and flexibility at an affordable price, with a range of inclusions that ensures your new home is completed with “must-haves” and “always-wanted” items already included. With a range of additional choices of fixtures and fittings offered in our Cosham Studios, your personal Interior Design Stylist will guide you through all of your available selections so you can truly define the style of your home and build a space that represents you. Complete transparency is also included as standard as we provide you with all the information you need upfront including individual home price, a complete list of our luxury inclusions, fixed pricing for structural and floorplan options, build schedule and step-by-step information. 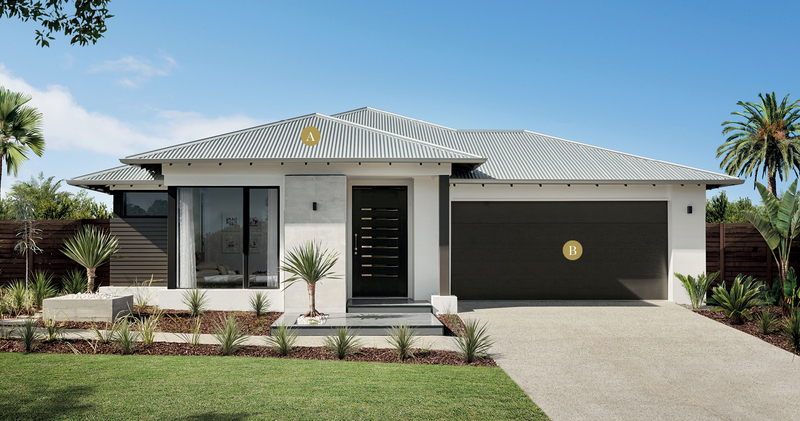 With a comprehensive inclusions list coupled with affordable and easy to understand upgrade packs, you will have your crafted Queensland lifestyle, in your chosen Breeze Collection home.